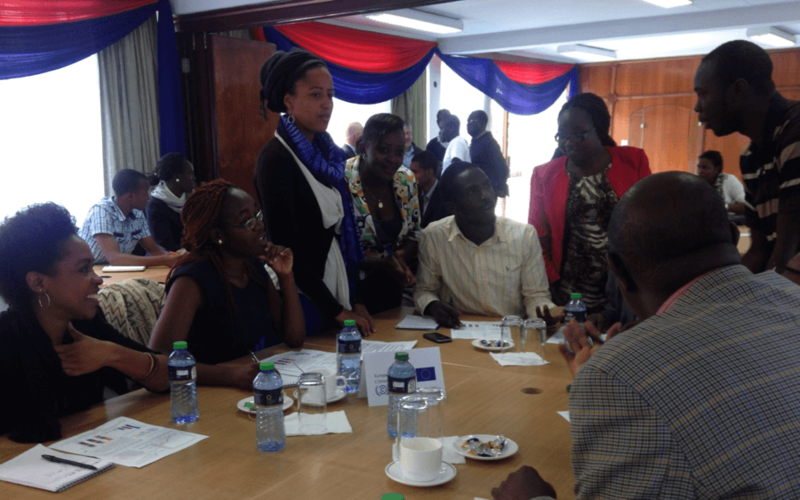 Ellie Johnston, Climate and Energy Lead for Climate Interactive, led the World Climate simulation in Nairobi to initiate our diffusion of the model-based role-play exercise in Africa, to lead up to 2016 UN climate change negotiations in Marrakech, Morocco. Here is her report. Last year we set an ambitious goal for ourselves to reach 10,000 people worldwide with the World Climate Exercise by the end of the Paris Climate Talks in December. We surpassed that goal and now have our sights set higher. This year the UN climate talks will be held in Marrakech, Morocco. We plan to place particular emphasis on reaching audiences in Africa ahead of these negotiations. In addition to reaching more people than ever with our UN climate negotiation exercise World Climate. Three weeks into January and I arrived in Nairobi, fresh from the Climate Interactive annual staff retreat, not quite sure what to expect. 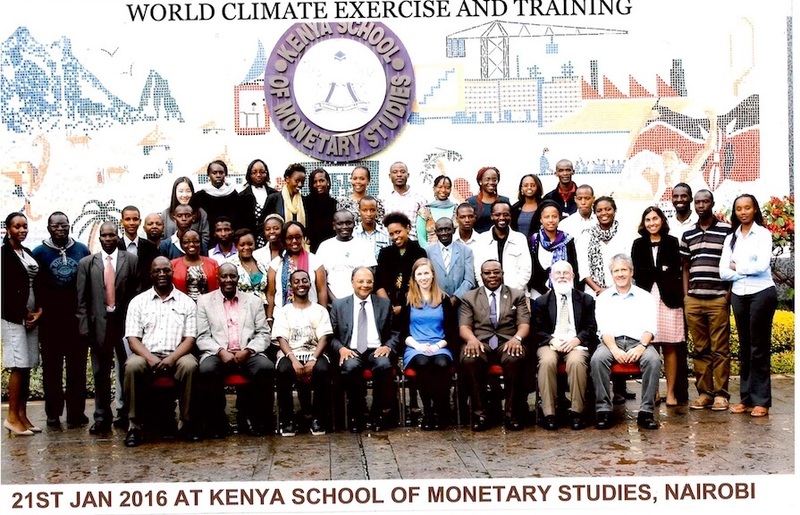 There we pulled off our first international training workshop in World Climate. We partnered with our system dynamics colleague Professor Ddembe Williams of KCA University in Nairobi, the System Dynamics Chapter of Africa, and Linking Industry With Academics. The week before the event we didn’t know how many people to expect or even if this sort of event would draw much interest. Using our loose network of contacts in the Nairobi area—people who had enrolled in our Climate Leader series, expressed interest in World Climate previously, and others—word began to spread about the event and the RSVPs began to pour in. Our initial hope of having 20 people in attendance was exceeded and the day of the event, when we counted who was in the room, we saw that we had exceeded 40. Most of the attendees came from the Nairobi area and were either students or coming from community organizations working on climate change. There were a handful of professors, a couple people that made it from Tanzania, and a group that joined us from the UN Environmental Program (UNEP). The day began with everyone participating in the World Climate Exercise. I divided the group into those representing the US, EU, China, India, Other Developed Countries, and Other Developing countries. They reviewed the briefing statements and set to work setting their plans and proposals. At first, there wasn’t much discussion between the groups. Then plenary presentations happened and everyone got a sense of the positions and saw when we entered them into C-ROADS that they were insufficient to reach the goal they had set out of keeping global warming to well below 2°C and aiming to keep it below 1.5°C. The team representing China stood up and made a case for why China was a developing country that couldn’t contribute much to the Green Climate Fund and to reducing emissions. This was met by a burst of laughter across the room, as people pointed out that China had much more economic power and ability to take action than most and should not categorize itself with the other developing countries. Indeed Chinese investment and demand for resources has been driving economic growth across Africa in recent years. The last group to present their position was the Other Developing countries, they argued that they weren’t going to do anything until they got $100 billion in financing from the Green Climate Fund. This also elicited strong reactions across the room. In the debrief after the exercise many highlighted the divergent opinions about the actions of the other developing countries. Some felt developing countries should expect financial support from developed countries to address climate change, while others disagreed and felt like they needed to take action themselves and not wait on developed countries to provide support. What plays out in the real world will inevitably be a mix of the two. There may be some support from developed countries but it will be inadequate for what is needed and developing countries will need to put their own resources into taking on this challenge. Fortunately addressing climate change is not a zero sum investment, shifting to low carbon energy sources like wind and solar provides multiple benefits. It reduces air pollution, provides an energy source that doesn’t require a steady supply of extracted fuels that need to be imported, and once the infrastructure is paid for, energy can be generated at no cost. After debriefing the exercise and grabbing some lunch, we returned for a discussion about what had happened at the Paris climate talks and how the agreement that they had created in the morning compared. This was followed by a look at the what people need to run the World Climate Exercise themselves. Many expressed interest in more training and resources. I hope this is the first of many events to come as we gear up for the next round of climate change negotiations and seek to make the pledges that countries have put forward and the actions they are taking much stronger. If you are interested in keeping updated about our emerging work in with the World Climate Exercise in Africa please email me at info@climateinteractive.org.